Creating well documented, high quality and accurate healthcare reports with the use of structured reporting. To support the delivery of high quality care, there’s an increasing need to share information more efficiently and consistently across health and social care. The Transfer of Care (ToC) Initiative, brought about by NHS Digital, NHS England and the PRSB, aims to improve patient care by promoting and encouraging the use of professional and technical document standards. Reduction in costs by removing the administrative task of correcting information and eliminating paper exchange (Source NHS England). From 1 October 2018, to support improved communication, clinical workflow and more effective transfers of care, secure fax is no longer be permitted for sending discharge summaries to GPs from NHS Trusts, NHS Foundation Trusts or independent sector providers of acute services. Organisations now need to be using either secure email or direct electronic transmission to send and receive discharge summaries. Organisations are being strongly encouraged to adopt an electronic transmission approach for sending discharge summaries. Guidelines are agreed by NHS England, NHS Digital and the Professional Records Standards Body (PRSB) on the content of discharge summaries. Part of these guidelines are the AoMRC headings. The Academy of Medical Royal Colleges (AoMRC) headings describe the standards for the structure and content of patient records – structured reporting. In line with the Transfer of Care guidance, and with international customer support, we have developed a structured reporting module. The module supports clinicians to meet the requirements as part of the ToC initiative but also for those in clinical areas (such as Pathology) when a more clear, defined, quantifiable structure to reporting is required. 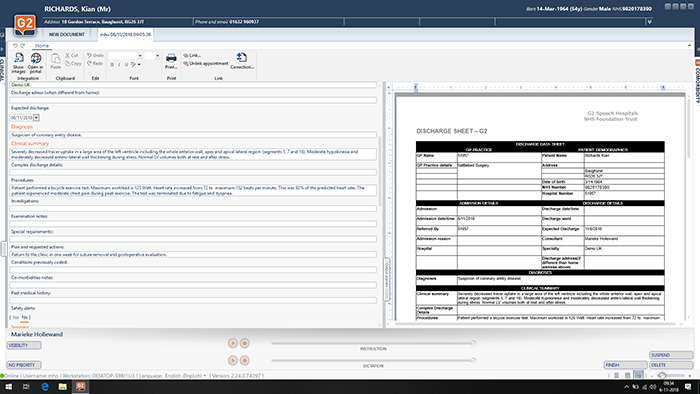 This innovative way of reporting allows clinicians to simply and quickly create reports, within templates, using speech recognition. Structured Reporting automatically extracts all data from patient letters and documents during their day to day reporting. This data can be used for example for research, national registries or clinical audits. Furthermore, a clinician can use it to make informed decisions. Below you will see an example of our Discharge Summary – Structured Report. This report has been created in line with the PRSB standards and in line with customer feedback. Historically clinicians have dictated in a narrative manner but given the current need for data combined with time and budget restraints, the need to create structured reports is proving highly important. To improve clinical documentation healthcare organisations are turning to data gathering by use of structured reporting. This helps a clinician to make informed decisions. Structured reporting eliminates the possibility of ambiguous language and uses a structured approach for more effectively analysis, creating opportunities for research, clinical decision support, and quality improvement. Radiologists are leveraging our speech technologies with predefined templates and data integration capabilities to improve their processes. All templates can be defined and controlled by the department itself. Codes such as SNOMED CT, ICD-10 and RadLex (i.e. coded information about operations, treatments, diagnoses, complications and comorbidities) can be automatically added to reports. This reduces the registration burden significantly. To improve quality of care, a large amount of aggregated data on the treatment of a patient is essential. An important part of this data gathering is within, for example, a radiology report. The radiology department at Erasmus MC initiated a partnership with G2 Speech to create an easy to use, structured reporting tool. The goal was to simply collect data without affecting the workflow of the radiologist. Via Structured Reporting a clinician is presented with a fully configurable template that after dictating, provides a clear overview for the referrer – this includes all necessary information as well as adhering to national guidelines. This input will also be stored in their EPR and a national registry database. Herman Pieterman at Erasmus MC said: “The data is automatically extracted and accessible for the clinician. He/she doesn’t have to request an external authority or provider to make the aggregated data available. However, the data needs to be presented in such a format that he/she can extract immediate results from it. Per patient, the data will be shown on one line.” According to Herman, quality control is the most important advantage of structured reporting. “This is the only way to discover how we perform compared to our peers. Another benefit is that we can control complications and report critical findings. The compliance to guidelines will increase sharply. Also, data will be accessible to regional or national registrations. This is also how the burden of registration can be taken away from other specialists, as a significant part of the treatment is determined by radiological findings”.